Ski Baby! ~ Sardinia Baby! 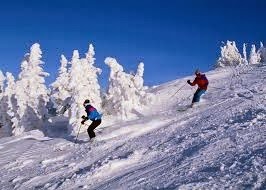 Water skiing maybe but skiing on snow is something rarely associated with the sun drenched Island of Sardinia. However there are no less than four ski resorts on the island offering a moderate skiing experience for less than the main European snow attractions. If you are a beginner or have children this may well be the holiday for you. The main resort is called Bruncu Spina and is Sardegna’s second highest mountain. It is located in the Gennargentu Mountain Range in the centre of the island and is the only mountain in Sardinia which boasts ski lifts and downhill skiing. At 1828m, however, it is not quite high enough to guarantee secure ski conditions so the number of days per year on which you can actually ski are limited. Bruncu Spina is the northernmost summit of the main Gennargentu ridge which includes all the five highest summits in Sardinia. All are around the same height (1800m) with Punta La Marmora being the highest one.